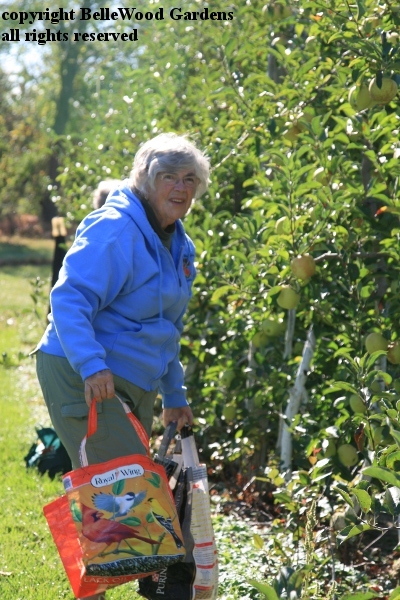 Back in August several ladies from the Tohickon Garden Club came to the Clifford E. and Melda C. Snyder Research and Extension Farm to pick peaches for the food bank, 600 pounds or so. And then some for ourselves. 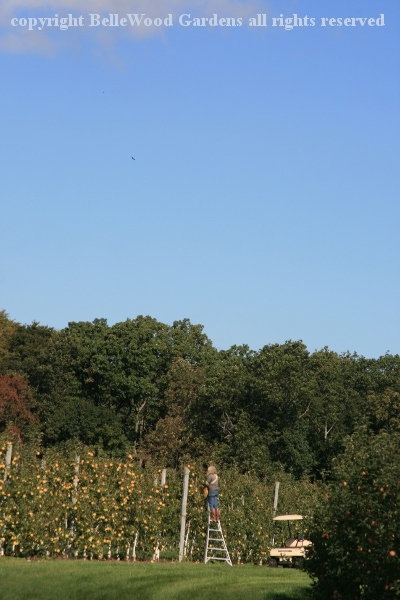 Today we're back to pick apples. It's a perfect day - comfortable temperature, gentle breeze, sunshine. Since this is a research institute the crops must be observed, studied, collected, weighed, all to provide information. We can only pick where and as directed. 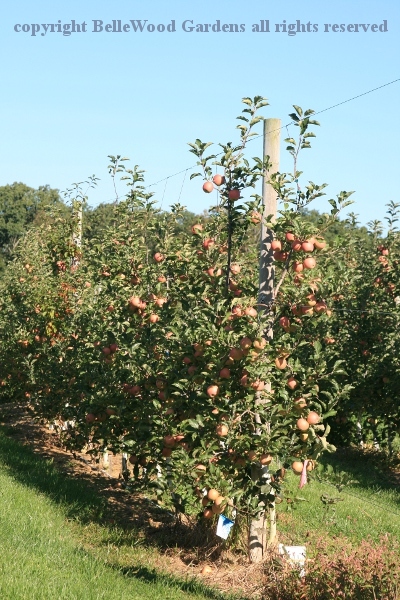 spindle trained trees loaded with fruit. 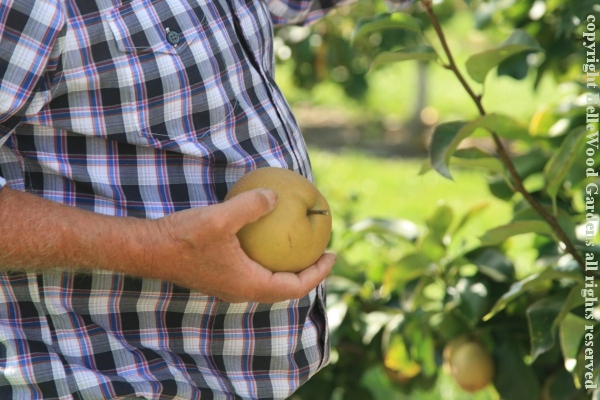 of Lady Williams and Golden Delicious. No sampling. Someone is at the end of the row, up a ladder. our feet on the ground, avoiding any accidents. transfer into the boxes for the food bank. So many apples. Basically we each choose a tree and start picking. puts the lid on and adds it to the others on the trailer. Then they are loaded into Evelyn's car to be delivered. with the apple trees. 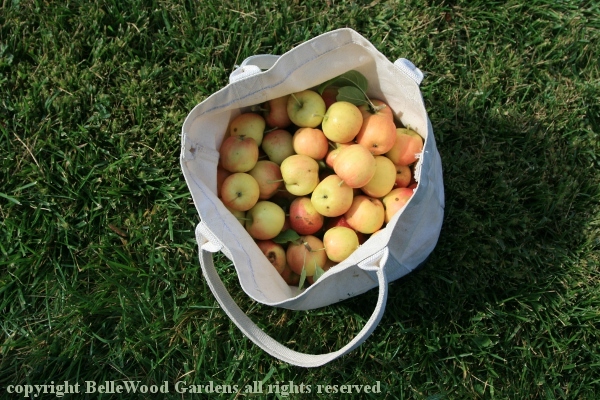 I pick a bag to take home to make preserves. 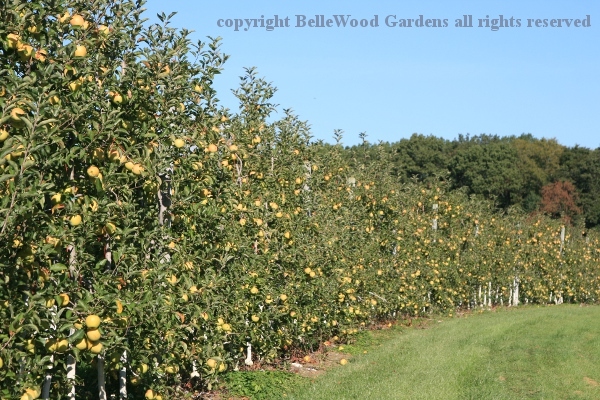 Then we looped around to where the Asian apple-pears are growing. That's really a silly name because they're nothing like apples, or pears. When ripe (which can be difficult to determine) they're very juicy, with a crisp / somewhat crunchy texture. 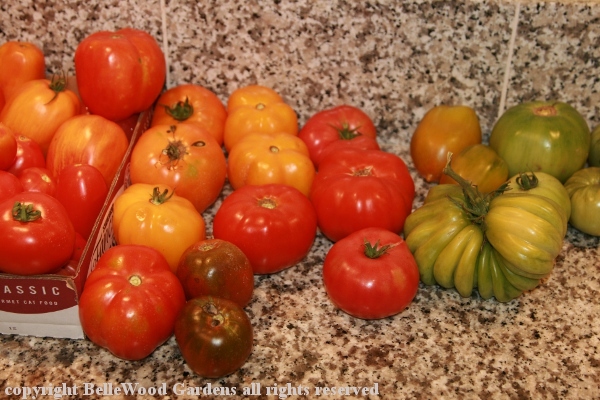 Different cultivars ripen at different times, over a couple of months. Maybe growers that are familiar with them can tell by appearance. That doesn't include us, however, so Geoff told us to look for trees where some fruit had fallen off, then pick from those trees. 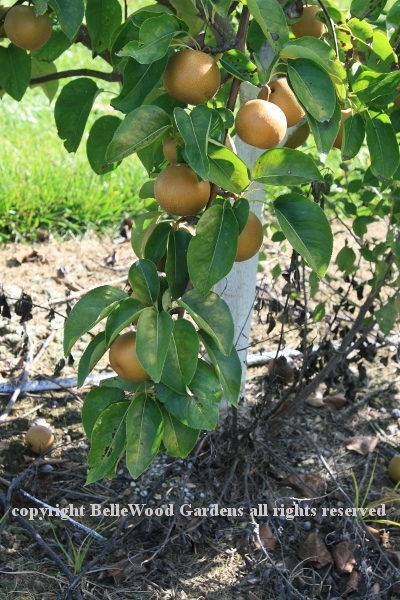 The fruits are slightly flattened spheres, and a honey-tan color. As you can see some of them can be quite large. Geraldine decided to try picking into a proper basket. goes over your head. So your hands are free to pick. 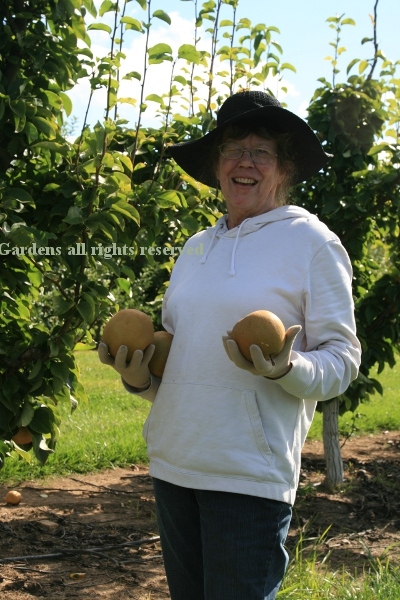 Karen couldn't resist these two beautiful fruits. 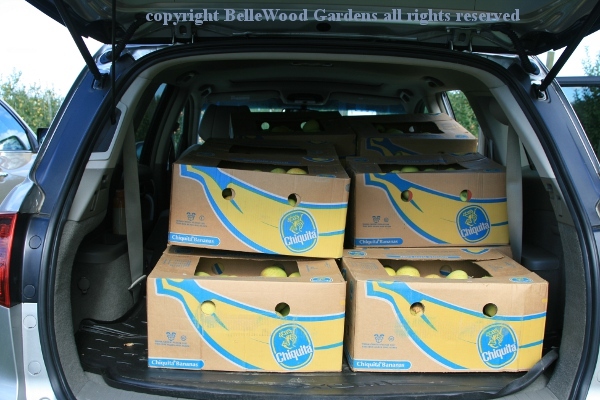 We picked so many boxes of Grimes Golden apples that Evelyn's SUV was full. 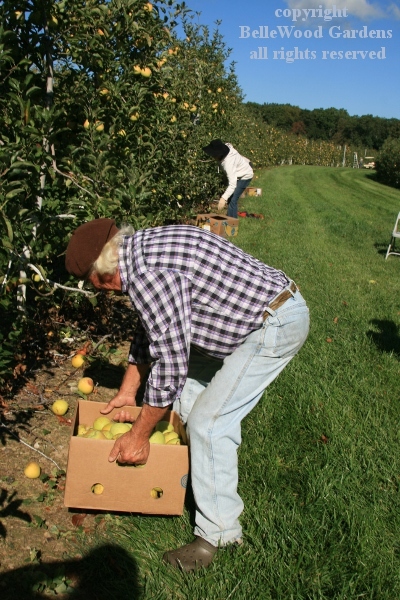 She had to call her husband to come to get the boxes of Asian apple-pears we also picked. 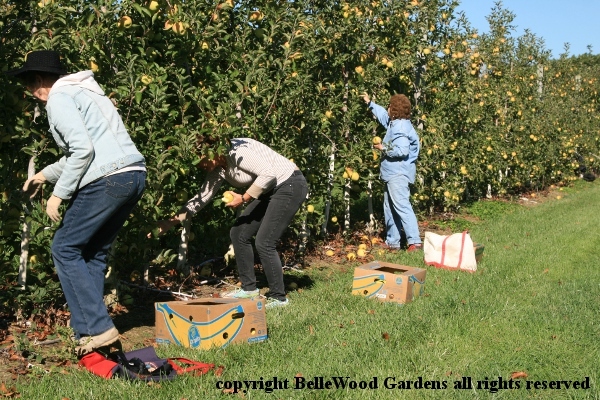 All told, we picked a total of 1,125 pounds of fruit for the food bank. They're really grateful, and so are the recipients who receive the distribution. 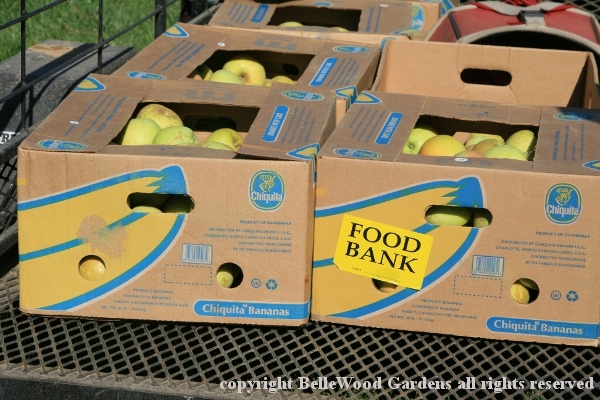 I suppose fresh fruit might be difficult to have donated in quantity. Then Geoff let us pick tomatoes - as you can see I got maybe a little carried away. But I think the tomatoes all came home with us. Can we say Marcella Hazan's fresh tomato sauce, and some type of green tomato pickles are in my future . . .